Planning liturgical celebrations: seasonal and special days. Scheduling parish missions and Eucharistic Days. Cooperate with other groups in providing care for the Church furnishings and decorations. Help create a proper environment for worship. 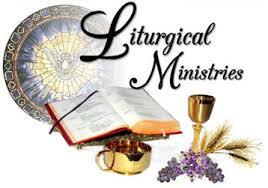 Oversees the scheduling of Lectors, Extraordinary Ministers of Holy Communion, and other liturgical ministries. Who: All parishioners are welcome who wish to share their life of faith with the parish through its spiritual development. This committee cooperates with the pastor, staff and other parish groups to help build the parish’s liturgical, devotional, spiritual and prayer life. When: Meetings are held monthly on the third Monday.